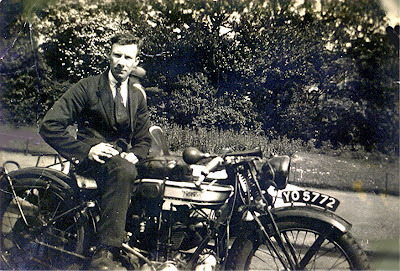 -By Danny- This photo shows my grand father riding his beloved Norton. It was scanned from an old family photo print that I have in my collection. I believe it's from the late 1920's or early 1930's judging by my grand father's age. His name was Frederick Harris incidentally. -JdK- Registration YO5772 was issued between April and June 1926 in London. The Norton therefore likely is a 1926 Model 18. Note is has electric lights, a magdyno and a sidecar attached.